Dundee Central Library holds one of the largest and most varied collections of local history materials in Scotland. Without the dedication of Alexander Crawford Lamb, the legacy of over 450 boxes of ephemera, including maps, photographs, books and prints would have been lost to future generations. The collection was acquired after his untimely death during a trip to London by Edward Cox, a local business man, and donated to the city. Alexander Crawford Lamb (1843-1897) was the son of Thomas Lamb, the owner of a temperance hotel in Dundee's Murraygate. A second hotel was opened in 1867 in Reform Street, for which A.C. Lamb became responsible after his father's death in 1869. Lamb's Collection was known throughout the city. It formed the basis of the celebrated "Old Dundee" Exhibition (1892-3). 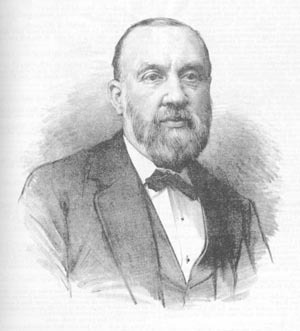 Lamb himself wrote several articles and books, the most famous of which was his monumental study Dundee: Its quaint and historic buildings, published in 1895 by the local printer, George Petrie. It was reviewed in The Spectator on 19th October that year: "Mr Lamb deserves high praise for his painstaking and interesting work, which must have cost many years of self-denying labour. It is too large and costly to pass into the hands of the general public, though a judicious selection might easily be made for their use; but many in Dundee can well afford to purchase it, and they ought not to miss the opportunity of possessing themselves of a splendid memorial of their ancient city." The reviewer concludes:"A word of praise must be given to the illustrations which adorn Mr Lamb's sumptuous volume." A Prospectus, which was printed in 1893, announces a limited edition of 350 copies, each with 50 plates, printed on specially-manufactured paper (in two varieties - one for the illustrations, the other for the letterpress), at a cost of five guineas (£5.25). 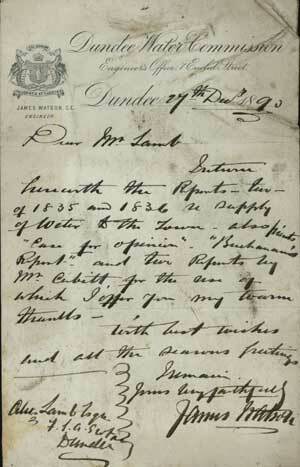 The letter shown on the left (dated 27th December 1890) is from James Watson, the Dundee City Water Engineer, who had borrowed Lamb's copies of records from 1835 and 1836 discussing the supply of water to the town. 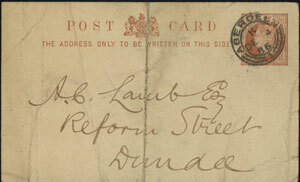 Lamb's activities were not restricted to collecting and documenting Dundee's past. As well as running a busy city centre hotel, he was a member of various associations and clubs (particularly those interested in artistic pursuits), and a keen participant in politics. 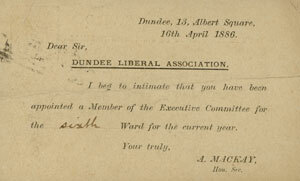 This postcard shows how active a part he took, being elected to the Executive Committee of the Liberal Association for the Sixth Ward. The Silence of the Lamb is a new initiative. Its object is to select, digitise, and database 2400 items, together withapproximately 9,000 digital images. An advisory group was formed (SOLAG) and meetings were held to discuss the selection process. Members were then asked to compile boxlists for up to 20 boxes, highlighting items in need of conservation, and those which should be included in the project. The Project is funded by Resources for Learning in Scotland (RLS) and being managed on their behalf by the SCRAN.